The Swimming Bladder is a saclike organ made up of a transparent membrane full of gas. It is found between the guts and kidney. This organ can be affected by many different infectious and non-infectious pathogens. Unfortunately these findings go unnoticed and are not described in the pathological reports. 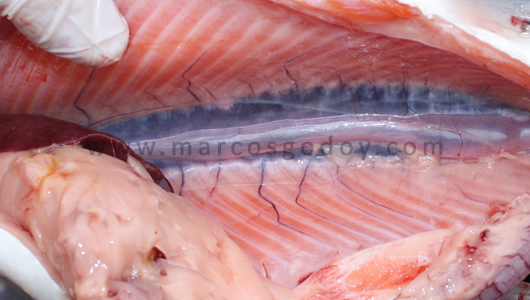 Some of the non-infectious pathogens are the deformations of the swimming bladder seen in the Coho salmon (Oncorhynchus kisutch), the Atlantic salmon (Salmo salar) and the Rainbow Trout (Oncorhynchus mykiss). The Swimming Bladder is a saclike organ made up of a transparent membrane (salmonids) and it can be found between the guts and the kidney. Histologically the Swimming Bladder is made up of a cubic epithelium, which overlays an adventitia, thin muscular layer and finally a submucosa. This is where the majority of the blood vessels are found. Two morphological types of Swimming Bladder are described basically for the teleostei fish: physostomous and physoclisti. The physostomous are the fish that have a connection of the swimming bladder to the gut through a special duct (pneumatic duct). In the physostomous fish, the gas pressure can be regulated through capturing or releasing the air through the digestive system. 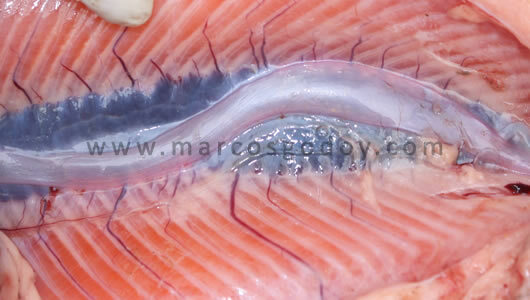 This kind of swimming bladder can be found in Salmonids, Trout, Catfish, etc. On the other hand are the physoclisti fish which do not have a connection between the Swimming Bladder and the gut. The gas pressure inside of the Bladder is regulated by special tissues or glands. This type of Swimming Bladder is found in the perciform fish. The main purpose of the Swimming Bladder is to maintain buoyancy. In some species it is also described as helping the respiratory system and also as a receptor organ and a producer of sounds. Deformations of the swimming bladder have been described in approximately 26 species throughout the world (Trotter et al, 2001). However, they are scarecely described for the salmonid species. 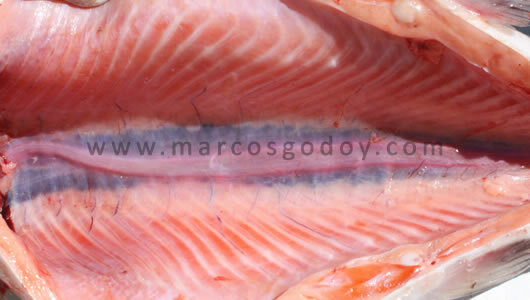 The swimming bladder for the Atlantic salmon (Salmo salar) is described as shortened and dilated, confined to the front part of the abdominal cavity (Poppe et al, 1997). The affected fish are found at the border of the tanks and eventually will show altered swimming patterns (lateral swimming). Deformations of the Swimming Bladder affect all threee salmonid species in Chile. It still has not been evaluated the pathological importance or productive importance that this can be. 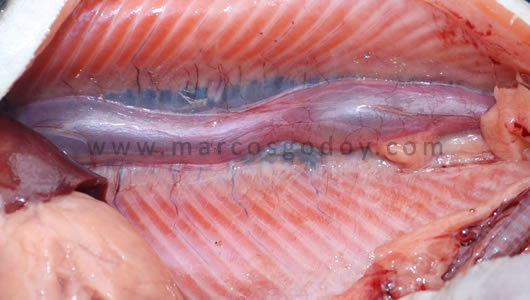 Deformations of the Swimming Bladder in Rainbow Trout (O. mykiss) are mainly seen in sea water. This could be because the testing of this organ is not so important in fresh water. Swimming Bladder Atrophy, traces of the swimming bladder can be seen mainly formed by the connective tissue. Partial stenosis located in the middle, skull or tail. Complete stenosis without altering its direction. Complete stenosis altering its direction (sigmoid). This classification list should be considered as a guide because there are many complex variants of deformations. Figure 1: A Rainbow Trout Oncorhynchus mykiss) that has been affected by a deformation of the swimming bladder. A complete atrophy can be seen of the swimming bladder. Figure 2: A Rainbow trout (Oncorhynchus mykiss) that has been affected by a deformation of the swimming bladder. A complete stenosis can be seen of the Swimming Bladder. Figure 3: A Rainbow trout (Oncorhynchus mykiss) that has been affected by a deformation of the Swimming Bladder. A complete stenosis can be seen with its direction altered, sigmoid. 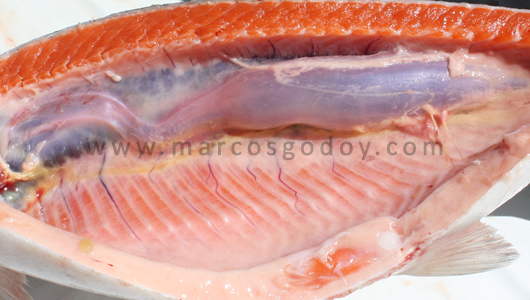 Figure 4: A Rainbow trout (Oncorhynchus mykiss) that has been affected with a deformation of the Sweimming Bladder. A complete stenosis can be seen of the Swimming Bladder with a skull alteration in its direction, sigmoid. Figure 5: A Rainbow trout (Oncorhynchus mykiss) that has been affected by a deformation of the Swimming Bladder. A skull stenosis can be seen with a change in its direction, sigmoid. Figure 6: A Rainbow trout (Oncorhynchus mykiss) that has been affected by a deformation of the Swimming Bladder. A partial stenoiss can be seen located in the middle. The etiology of this condition is still unknown. Some of the risk factors that can be considered are the alterations of the water quality while the fish are developing or while they are being handled, such as the triploidization. A surveillance of the alterations of the Swimming Bladder in fresh and sea water make up key elements for doing a follow-up of the affected fish. La Vejiga Natatoria es un órgano sacular, compuesto por una membrana transparente, llena de gas, que se encuentra entre la masa visceral y el riñón. Este órgano puede ser afectado por un diversas patologías infecciosas y no infecciosas, lamentablemente en muchos casos los hallazgos pasan desapercibidos o no son descritos en los reportes patológicos. 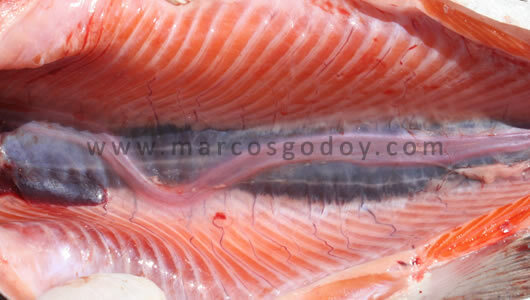 Entre las patologías no infecciosas se encuentran las deformaciones de la vejiga natatoria, que son observadas en Salmón coho (Oncorhynchus kisutch), Salmón del Atlántci (Salmo salar) y Trucha Arcoiris (Oncorhynchus mykiss). La Vejiga Natatoria es un órgano sacular, compuesto por membrana transparente (salmónidos), que se encuentra entre las visceras y el riñón. Histológicamente la Vejiga Natatoria se encuentra conformada por un epitelio cúbico, el cual sobreyace a una adventicia, delgada capa muscular y finalmente una submucosa, en la cual se encuentran la mayoría de los vasos sanguíneos. En los peces teleósteos se describen basicamente dos tipos morfológicos de Vejiga Natatoria: los fisóstomos y fisoclistos. Los fisóstomos son aquellos peces que presentan una conexión de la vejiga natatoria con el tracto intestinal mediante un ducto especial (ducto neumático). En los peces fisóstomos la presión de gas puede ser regulada mediante la captación o liberación de aire, vía sistema digestivo. Este tipo de vejiga natatoria puede ser encontrado en Salmónidos, Trucha, Catfish, etc. Por otro lado los fisoclistos no se encuentra conexión entre la Vejiga Natatoria y el tracto intestinal. En estos la presión de gases al interior de la Vejiga, es regulada por tejidos especiales o glándulas. Este tipo de Vejiga Natatoria se encuentra en los Perciformes. La principal función de la Vejiga Natatoria es la mantención de la boyantes, en algunas especies se describe algun rol en la función respiratpria y como órgano receptor y productor de sonidos. Las deformaciones de la vejiga natatoria han sido descrita en aproximadamente 26 especies a lo largo del mundo (Trotter et al, 2001), sin embargo son escasamente descrita en especies de Salmónidos. En Salmón del Atlántico (S.salar), se describe acortamiento y dilatación de la vejiga natatoria, confinado a la porción anterior de la cavidad abdominal (Poppe et al, 1997). Los peces afectados se encuentran en los márgenenes de los estanques, y eventualmente presentan patrones alterados de natación "natación lateral". En Chile las deformaciones de Vejiga Natatoria afectan a las tres especies de Salmónidos, siendo su significado patológico y productivo aun no evaluado. Las deformaciones de Vejiga Natatoria en Trucha Arcoiris (O. mykiss), son observadas principalmente en agua de mar, probablemente asociado a la poca relevancia que se otorga al examen de este órgano en agua dulce. Atrofia de Vejiga Natatoria, se observa vestigio de la vejiga natatoria, principalmente formado por tejido conectivo. Estenosis parcial de localización media, craneal o caudal. Esta propuesta de clasificación debe ser considerada como una guía, ya que en la práctica se observan variantes complejas de deformaciones. Figura 1: Trucha arcoiris (Oncorhynchus mykiss), afectada por deformación de la vejiga natatoria. Se observa atrofia completa de la vejiga natatoria. Figura 2: Trucha arcoiris (Oncorhynchus mykiss), afectada por deformación de la vejiga natatoria. Se observa estenosis completa de la Vejiga Natatoria. Figura 3: Trucha arcoiris (Oncorhynchus mykiss), afectada por deformación de la Vejiga Natatoria. Se observa estenosis completa, con alteración de la orientación, sigmoídea. Figura 4: Trucha arcoiris (Oncorhynchus mykiss), afectada por deformación de la Vejiga Natatoria. Se observa estenosis completa de la Vejiga Natatoria, con alteración craneal de la orientación, sigmoídea. Figura 5: Trucha arcoiris (Oncorhynchus mykiss), afectada por deformación de la vejiga natatoria. Se observa estenosis craneal, con cambio de la orientación, sigmoídea. Figura 6: Trucha arcoiris (Oncorhynchus mykiss), afectada por deformación de la vejiga natatoria. Se observa estenosis parcial de localización media. La etiología de la condición es desconocida. Alteraciones de la calidad de agua durante el desarrollo o manejos como la triploidización, pueden ser considerados como factores de riesgo. La vigilancia de las alteraciones de la Vejiga Natatoria en agua dulce y agua de mar constituyen elementos claves para el seguimiento de los grupos afectados.